The Artcade 8000 is a fully functioning, full-size arcade cabinet. It supports two players, each with a joystick and 8 buttons. Some highlights are a backlit marquee, speakers and a game selection in the thousands. 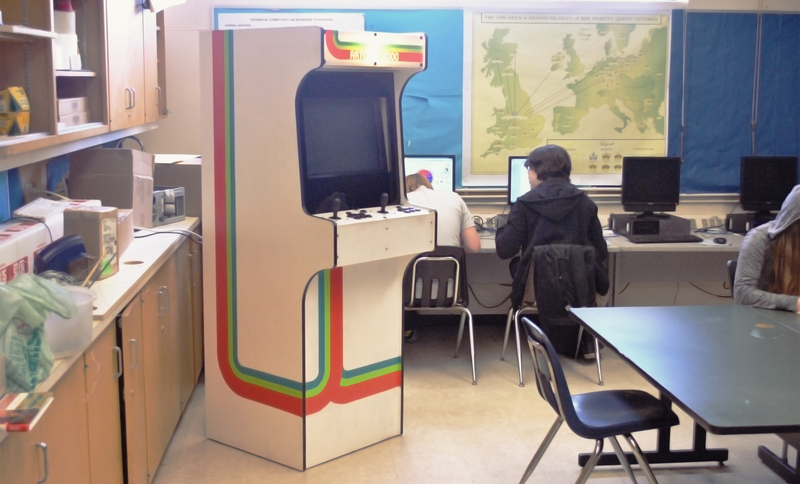 The arcade was created for a high school industrial design project with my friend Sir McMullen and came together in about a month from start to finish. 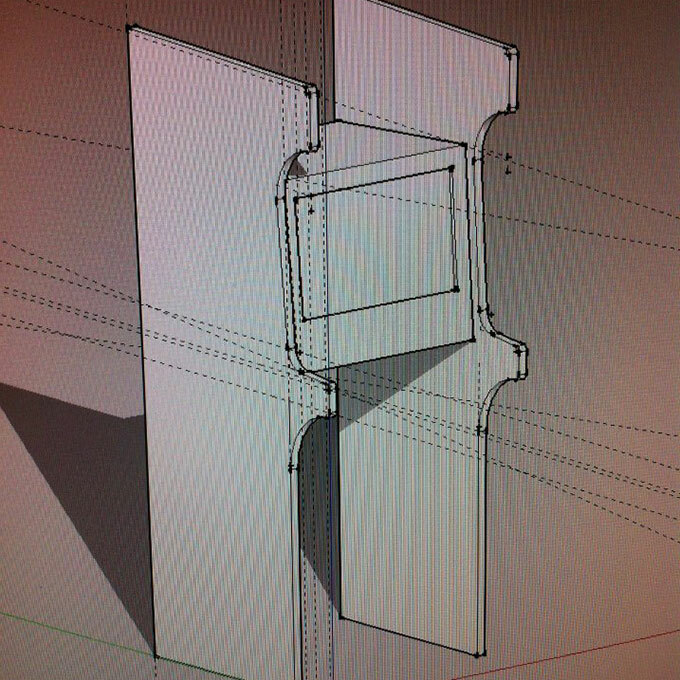 We started in Google SketchUp planning the locations of each of the components and the overall dimensions of the cabinet. We researched other cabinets for dimensions to make sure that playing the arcade would be a comfortable experience. Using a connection in a wood shop we were able to use their tools, scrap wood and glass. 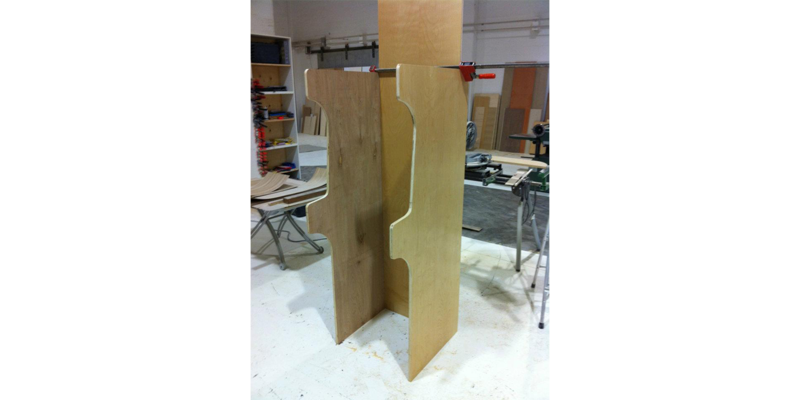 The body is plywood with a glass panel in front of the screen. We edged the cabinet with vinyl for a more professional look and to prevent wear and tear. Many layers of sanding, paint and clear coat later we arrived at the final look. We ordered our joysticks and buttons online and planned our control board to be ergonomically pleasing. 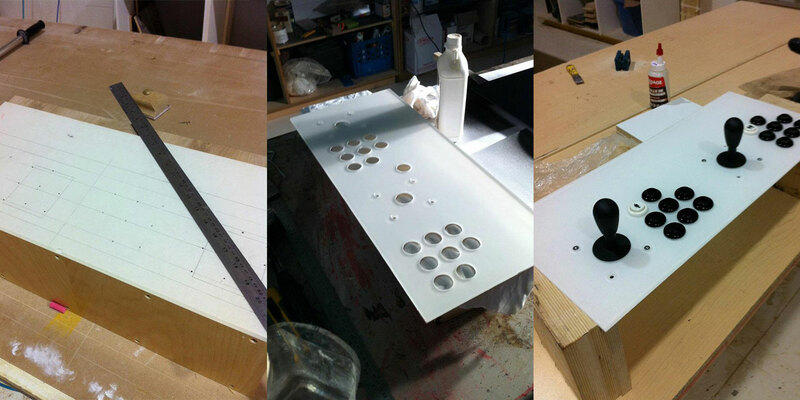 The surface of the board is back painted plexiglass with the buttons and joysticks secured with contrasting black screws. Mapping out and drilling the controls took a great deal of precision to ensure everything would fit and be comfortable. 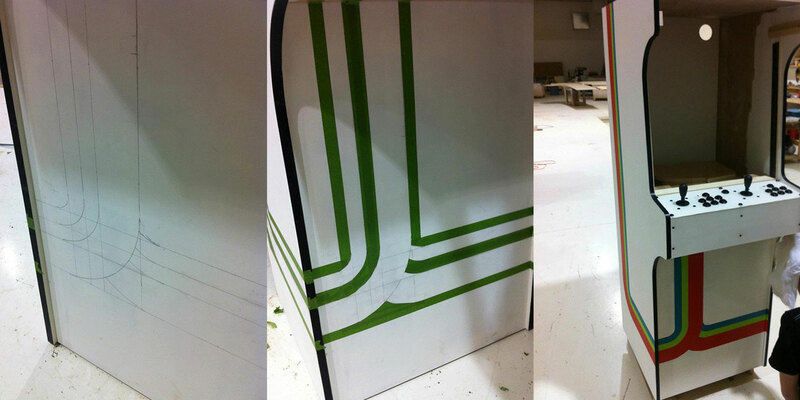 We designed the art for the marquee in Adobe Illustrator and printed it to scale on a translucent sheet. That sheet was sandwiched between two layers of rigid plexiglass for stability and light diffusion. Like the control board, it is fixed with black contrasting screws. The backlight and speakers are mounted inside the top of the cabinet. Each element of the control board is connected to a keyboard interface so each button and joystick direction is mapped to a key on a keyboard. Everything is connected to a power bar mounted inside the back of the cabinet. The light and speakers are wired around the back of the monitor up to the marquee. The design for the sides and the marquee was based on a retro RGB scheme but modified a bit to make things pop off of the white background. The sides took about three coats and each colour stripe took two. We covered the entire thing with 2-3 clear coats. The glass in front of the monitor was back painted black to give it a glossy finish and to hide the beige bezel of the monitor. The font on the marquee is a custom recreation of an old Atari font. We finished by closing the back with a wood panel cut with ventilation holes and installed the games. The whole cabinet currently sits in the design classroom at my high school.